The wedding reception was held in the annex of the Tokyo Kaikan. The bride and groom, as was customary, sat together in front of a gold screen. It was not fitting, to say the least, that a widower such as Shunsuke sit with them in the role of matchmaker. He was present as the famous and honoured guest. 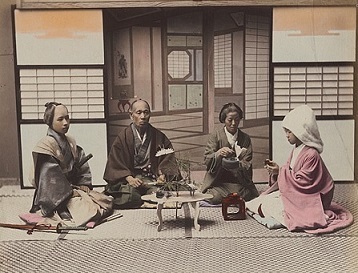 The old man was smoking in the lounge when he was joined by a couple dressed like all the others in formal kimono and morning clothes. The woman however stood out above all the others in the lounge with her dignity of mien and her slender coolly beautiful face. Her serious clear eyes unconcernedly observed all that was going on around her. She was the wife of the former count who, with her as accomplice, had extorted 300,000 yen in blackmail from Shunsuke. To one who was aware of this, the affected detachment of her glance had the aspect of a search for further quarry. observations: After giving it some thought, I have decided that I have a duty to point out that this extract makes the book sound a lot more normal, and also more exciting, than it actually is. Your opinion may vary. The old man, Shunsuke, has given the bridegroom – an extraordinarily beautiful young man, Yuichi - a large sum of money. To earn it, he has to marry the young woman, and also behave badly towards some other women, including the one who was party to the blackmail. Yuichi is gay. Surprisingly to me, the word seems to have had its modern meaning in the 1951 original, as Yuichi is invited to a Gei Pa-ti and ‘Gei is the American equivalent for homosexual.’ So Yuichi throughout the book also leads a wild sexual life of his own. Mishima is regarded as one of the greatest Japanese writers of the 20th century, was a contender for the Nobel Prize for Literature, and is famous for his rather exotic and flamboyant life – as well as writing he dabbled in film acting, modelling, body-building and martial arts, and is widely believed to have been bisexual. He had very right-wing views and committed ritual suicide after a failed coup attempt. So for UK comparison purposes, he was roughly contemporary with Kingsley Amis, but led a different kind of life. Keeping a lookout for a photo of that. Muffled in a straw poncho, this world idled through the daylight hours…. In the world of men they idled, muffled in all kinds of ponchos made of straw. The Tokyo Kaikan or meeting hall, contained elegant banquet facilities and a wedding hall, and several of Tokyo's first posh Western- and Japanese-style restaurants open to the general public. This information came from the Old Tokyo website, where you can see a picture of the building. Links on the blog: there are many wedding scenes on the blog – click on the label below – though not sounding a lot like this one. 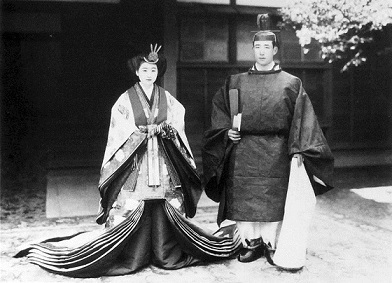 The pictures show Prince Nagahisa Kitashirakawa and his bride on their wedding day in 1935 and a Japanese wedding photograph from the 1890s – both images from Wikimedia Commons. Moira - This does sound like an unusual kind of book. And you make a well-taken point about the way a translation can get in the way of understanding and being drawn into a novel. And of course, it's a novel from a very different culture. Still, it does sound compelling in an odd sort of way. The one venture I made into Japanese fiction was a bit tedious. Almost Transparent Blue by Ryu Murakami, which I struggled with. I have more by him Haruki Murakami to get to, but I'm not in a hurry. I don't think I will be on the plane to Tokyo to get a copy of this one either.